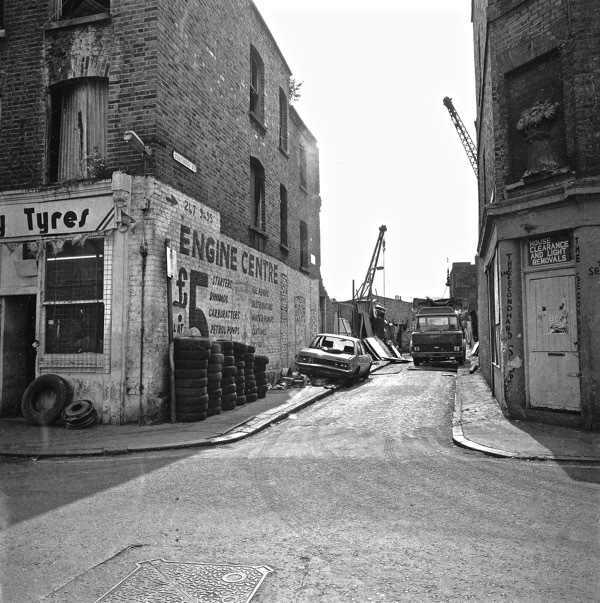 “I first started taking photographs of Winthrop St and Woods Buildings in Whitechapel in the mid-seventies. I remember the first time I went to Winthrop St on a cold frosty morning with a bright blue sky. A woman came out of one of the houses and asked what I was doing. ‘Photographing the streets,’ I said. ‘You’d better hurry up they’re coming down!’ she replied. She was right, within a few months they were gone. 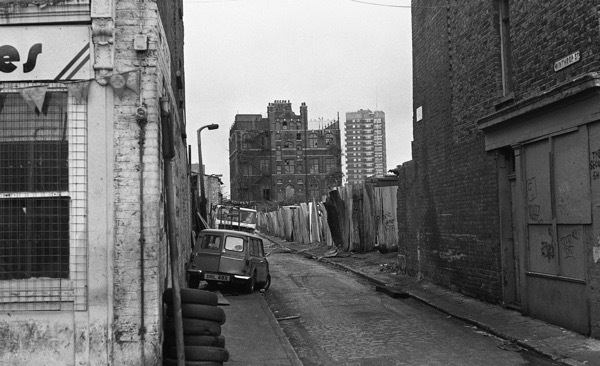 ‘Comprehensive Development’ was the only philosophy pursued by the London County Council and Greater London Council for rebuilding London after the war. Their planners complained that too much pre-war building was left, making comprehensive planning really difficult. Yet it would not have taken much imagination to have incorporated streets like these within any new development, creating a richer and more diverse urban landscape. Fabulous photos of a long gone era. 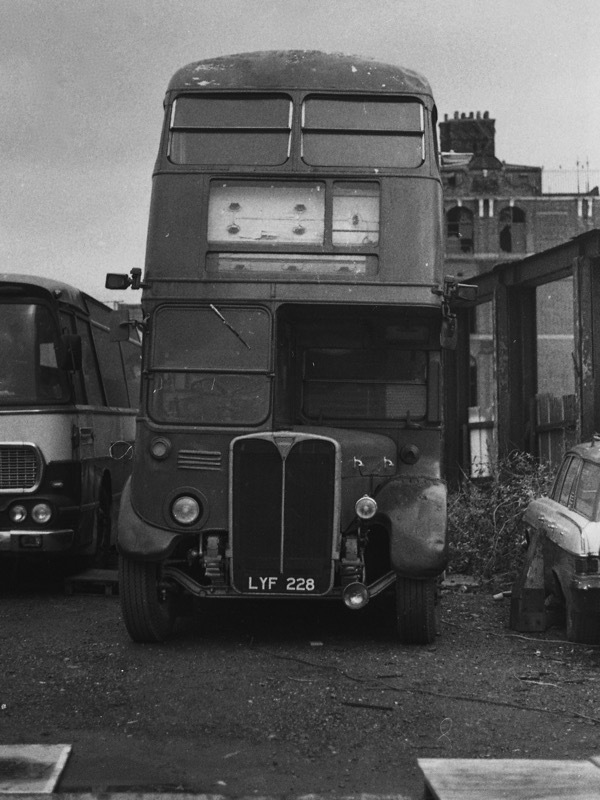 Your pictures of old Whitechapel are interesting and lovely. It is a pity, with the developers in cities that they do not incorporate the more interesting features of a declining area and rebuild some of the old houses in that area in a more modern but relative style to those houses in your photos. Yesterday I read that the ‘Communities’ Minister, Sajid Javid was interested in reclaiming railway yards etc. for the purpose of new build in cities. And yet……you say this old area is to be developed for Crossrail. It is sad that it is a fact of life that character building seems to be costly although Prince Charles seems to manage to put across his point. I sm writing from Madrid which Mr Javid mentioned as an example of how to accommodate a lot of people in a smaller area. However, although Madrid has its beautiful old Buildings and wide boulevards and many parks and walkways it is juxtaposed with back to back high rise square blocks of buildings where the majority of the population live, and where the only pleasant view is if you look up to see the blue sky….which I did, on one visit and promply fell down a pothole and twisted my ankle. It seems that nothing is perfect in our urban world where it seems architects have only discovered squares, triangles and oblongs, and wonder of wonders …moribund plate glass! Funny how the old bakery was a secondhand shop in Philip’s picture and a tyre shop in the picture linked by Julian Woodford, which I took. The same tyre shop was on the opposite corner. I would guess the two pictures were taken within weeks of each other. 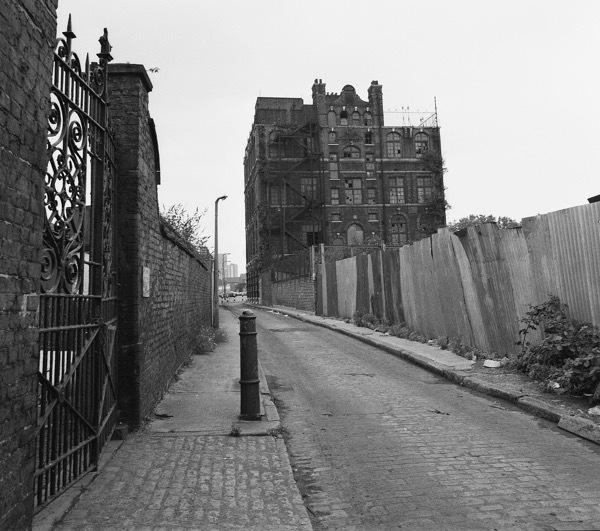 Winthrop Street, Durward Street and Brady Street were all demolished by the end of 1983 and now they are almost completely unrecognisable. Almost all of Winthrop Street has disappeared, apart from a small section next to the old school. The rest of it has been built on. Woods Buildings has gone too, it’s now called Court Street. 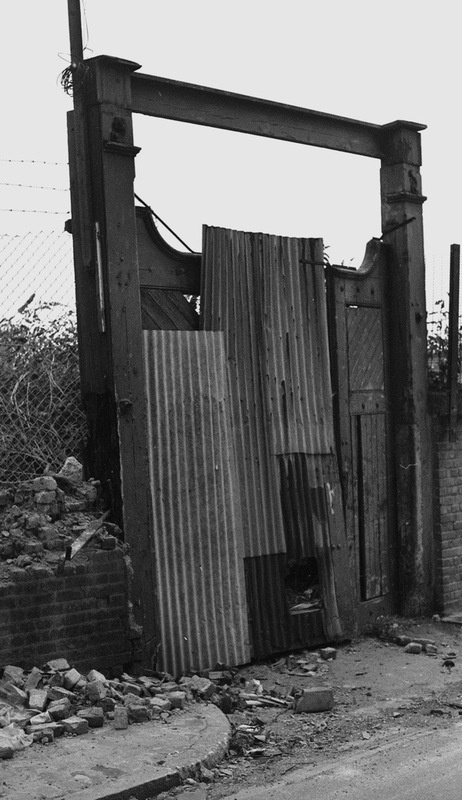 The old arched entry has been demolished and the three bollards have gone. 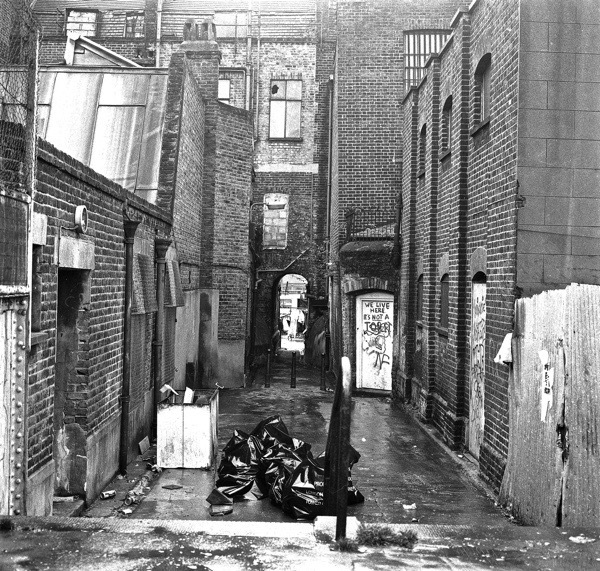 John Claridge also took photographs of the same place. What evocative pictures and that sense of bereavement at the loss of another piece of our heritage. Sorrowful photo of women so easily turned to violence. Having done a lot of research into the horse-slaughtering firm of Harrison, Barber, who had a yard in Winthrop Street, I’m intrigued by the image of the gateway there. Presumably it was on the south side of the street, but how far down? Excellent and evocative photos, sharp and clear. So glad they got taken. On looking again, it seems to me that the buildings in the left foreground of the long E/W view of Winthrop Street may have been Harrison, Barber’s office. Thank you for these photos GA. My gr. 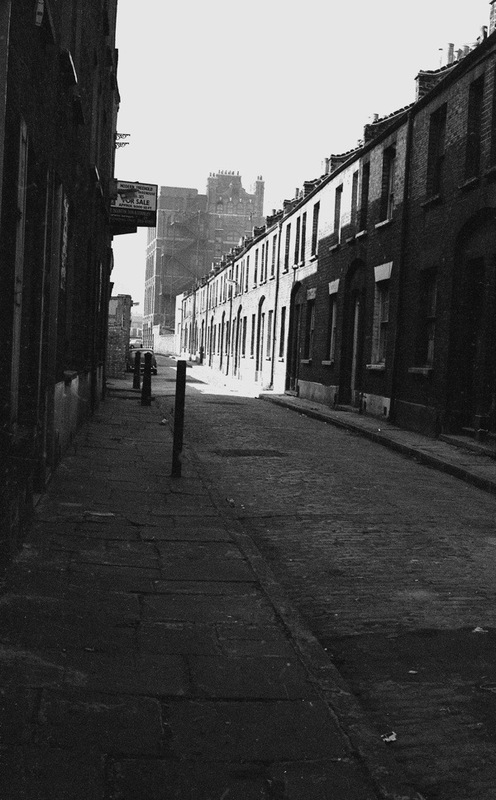 gr grandparents lived in Winthrop St, possibly in one of the houses in the first photograph. At one point, the census records show thirteen people (four generations) occupying one property. Such dreadful conditions are unimaginable to us these days. 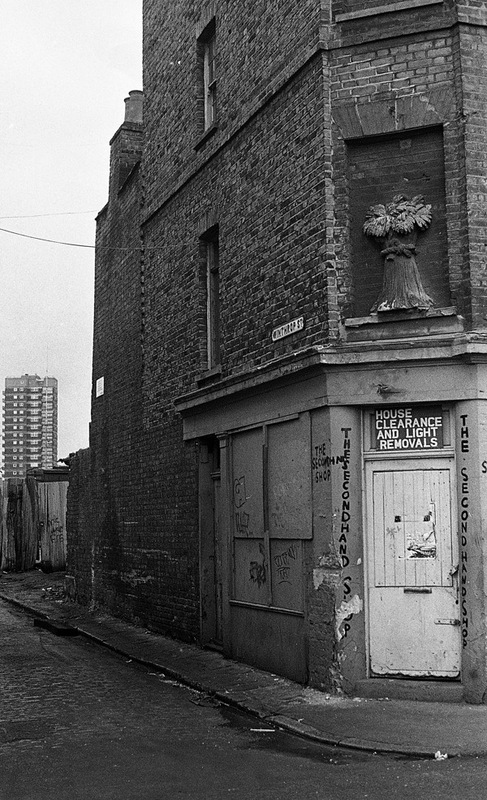 Marvellous photographs of a disappeared place. Loving these old photos GA. 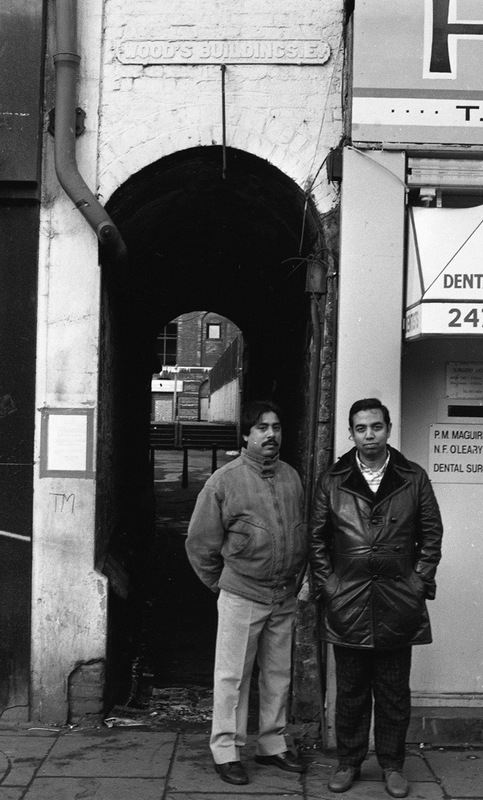 When I lived in Brick Lane in the early ‘90s I used to make short explores around this area. 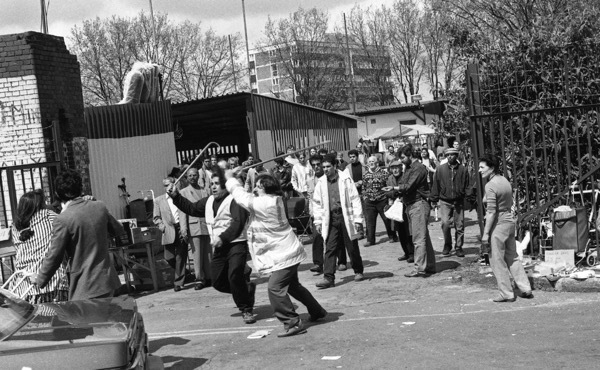 I remember all the open space in contrast to the crowded Whitechapel Road and including the derelict school which was quite striking. This was all before the sports centre, I think. And now I understand why there was so much space. Pleased that the school building has since been rescued. Thanks due to Google Street View for this morning’s desktop tour! Nice to see some of the same shops still on the WC Road. Thanks so much for posting these wonderfully evocative photographs. My great great great grandfather, Peter Salter, was born in Woods Buildings in 1803. His father, James was a packing case maker. I wonder if the place seemed as run-down then as it does now? These are fascinating photographs. I worked at Swanlea School which is on the corner of Brady Street and Durward Street from 2004-2017, so I know the area well. 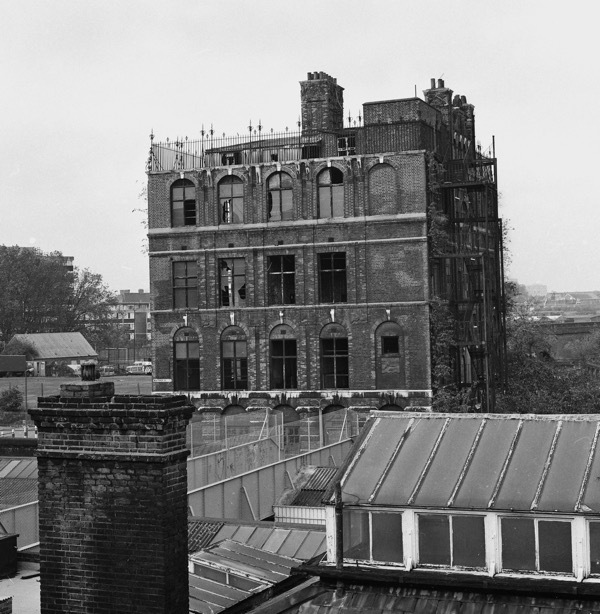 The SBL building, now Trinity House, was a constant companion but has been hidden from view recently by the Crossrail construction. 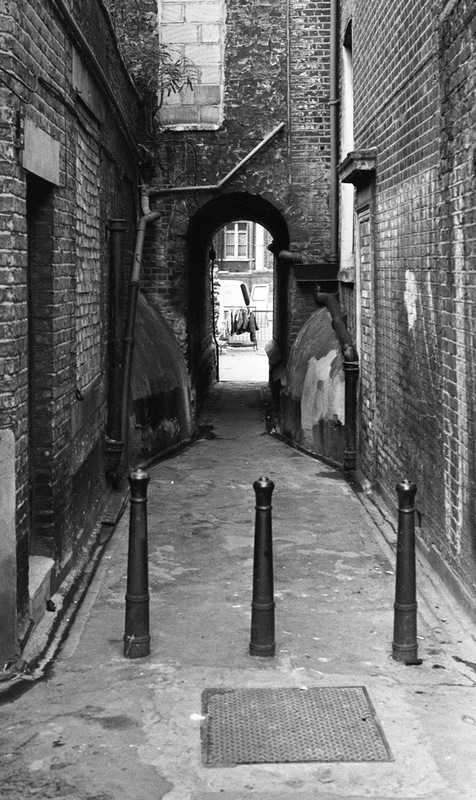 I’m assuming everyone knows that the first victim of the ‘Whitechapel Murders’ of 1888 was found close-by the school’s eastern end in what was the entrance to a stables in what was the called Bucks Row. The school was known as the Bucks Row Board School and thanks to research by the author John Bennett I have seen some facsinating school reports from the era. 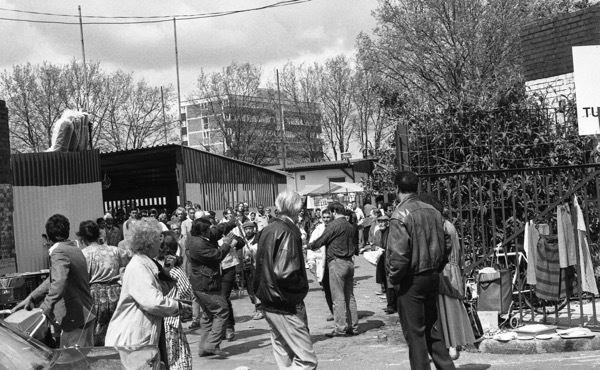 Thanks for sharing, this has helped with my curiosity of what the area looked like prior to its redevelopment in the late 1990s – although it will look even more different once the completion of Whitechapel station rebuild with its sweeping ‘garden’ bridge is completed. Fantastic photographs. 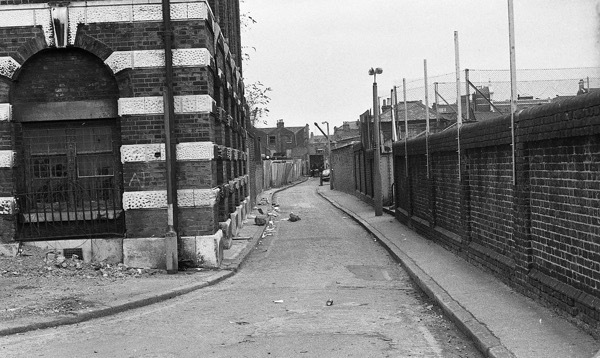 I was a young policeman in the 1970’s and patrolled all around Durward Street, Winthrop Street and Whitechapel Road. In the early hours of one morning, I encountered a young man in Woods Buildings with something bulky secreted inside his bomber jacket. I stopped him, suspecting the bulge was a car radio stolen from a vehicle in Durward Street. Next thing I knew, I was lying on the cobbles alongside those posts, wondering what had hit me. What a punch! Anyway, I never caught him. Am I right in thinking Durward Street was formerly known as Hare Row, the scene of one of The Rippers’s murders? Thanks for sharing these images. Terrific photos. 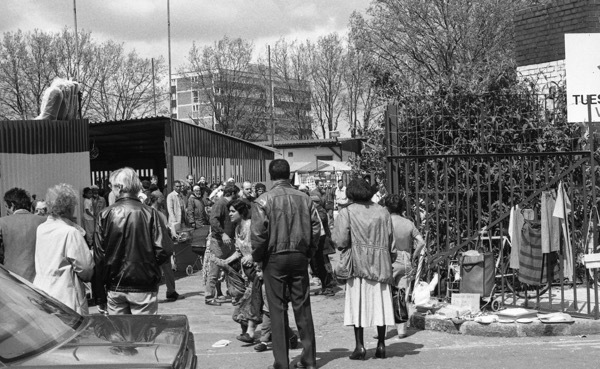 I remember car boot sales and markets in the area. The entrance to the alley is now blocked off with a private door. In 1994 odd I was a student in London, and desperate. For some months I lived in Woods buildings in a weird ancient Jerry built extension. The alley was my entrance. It was very scary to pass through at night to get to my door. You never knew what deposits you would find outside the door in the morning. It was used as a toilet, known locally as pi— allley and just reeked of stale urine. Rats and mice used to scurry across the floor and it was pretty much unfit for human habitation, but was rented out to students and occasional immigrants. Looking out to the old school and the area behind in the dead of night, when no-one else was around, and when there were occasional misty nights, totally evoked the atmosphere of the old Victorian ripper era. Beside the Woods buildings was a shop where in the 19th century John Merrick was discovered being exhibited in a ‘freak show’ before being taken to the Royal London Hospital across the road. After that I moved to 88 Mile End Road, owned by the same landlord. Although the original house was demolished, this was Captain Cook’s address!